More and more customers, industry analysts and even competitors are taking notice. 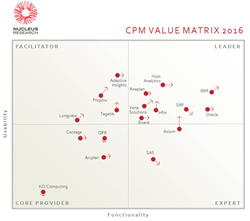 Vena Solutions, the fastest growing provider of cloud-based corporate performance management (CPM) software, is proud to announce that Nucleus Research has named it a market leader in its annual CPM Value Matrix report. High marks in usability and functionality established Vena as a CPM leader, alongside other vendors including IBM, Oracle and SAP. The primary driver behind Vena’s leadership – and its main competitive advantage – is its use of native Excel as an interface into companies’ performance management data. The company credits its intuitive application design along with Excel’s familiarity, flexibility and widespread use for the high adoption and rapid implementation of its solutions. Feature-Rich Product Roadmap – with upcoming innovations ranging from new data discovery and analytics to mobile dashboards and web grid integration for cloud applications such as Office 365. Vena turns Excel into an enterprise-class business solution with a centralized database and features including workflow, version control and a detailed audit trail. With Vena, hundreds of leading global brands now get trusted numbers and insights – fast – without sacrificing the significant investments they’ve already made in Excel templates, models and templates. They use Vena for corporate performance management (CPM) applications including budgeting, forecasting, financial close and reporting, in addition to managing business drivers and KPIs outside of finance. Vena is the fastest growing cloud CPM vendor, and the only one to embrace – not replace – Excel spreadsheets.